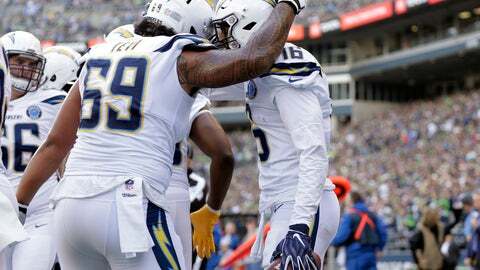 COSTA MESA, Calif. (AP) — The Los Angeles Chargers have proven during the first half of the season that they have plenty of weapons on offense. One who has emerged is Tyrell Williams, who has become a deep threat during the past month. Going into Sunday’s game at Oakland, the fourth-year wide receiver has four touchdowns and is averaging 28.8 yards per catch over the past three games. “He’s become a complete receiver. His receiving skills, he’s just taken them to another level,” Chargers coach Anthony Lynn said. With Keenan Allen still drawing double teams, Williams continues to benefit from single coverage. Five of his receptions during the past three games have gone for 20 yards or more, including a 75-yarder against Tennessee on Oct. 21. He is tied for the team lead in receiving touchdowns (five), second in yardage (451) and third in receptions (22) during the first half of the season. “I think it’s really just been seeing what the defense does, when to take shots, being able to get over the top and trusting my ability to go up and get the ball or run past the defense,” said Williams, whose 20.5 yards per reception average is third in the league. Philip Rivers also hasn’t been afraid to go to Williams on consecutive plays if the matchup is favorable. Williams caught both passes on a two-play, 89-yard drive midway through the second quarter of the Oct. 14 game at Cleveland, including a 45-yard touchdown where he got leverage over cornerback Damarious Randall. While Williams has made his biggest impact on downfield plays, he has also shown his improvement in other areas. Late in the first quarter of last Sunday’s game at Seattle, Williams made a diving grab on a back shoulder fade for a 14-yard touchdown while being covered by Tre Flowers. Williams said catching back shoulder passes and route running were two things that he placed added emphasis on improving this past offseason. Los Angeles (6-2) has won five straight for the first time since 2014 and will face a Raiders defense that is 24th against the pass. Williams had three receptions for 66 yards in the first meeting on Oct. 14, which the Chargers won 26-10. One of the catches was for 48 yards. “Hopefully that stays the same and they don’t switch it up. It’s nice to get single coverage and Keenan still being able to go for 100 like he did, to be firing on all cylinders,” he said. Notes: Defensive end Joey Bosa did not do any team drills, meaning he’s unlikely to play in his first game of the season this week. … Lynn has left open the possibility that LB Kyzir White could return later in the season. White was placed on injured reserve Saturday due to a knee injury.